Pollycarpus Budihari Priyanto, lower right, speaking to prosecutors and judges during his murder trial earlier this week in Jakarta. The trial of the lone suspect in the death of Indonesia's most well-known human rights campaigner began this week in Jakarta. Pollycarpus Budihari Priyanto, a 44-year-old pilot with Indonesia's national airline, Garuda, was charged Tuesday with masterminding and executing the murder of Munir Said Thalib, the 38-year-old founder of two of Indonesia's most prominent human rights organizations. The prosecutor's indictment alleges Pollycarpus laced Munir's orange juice with arsenic last September on a flight from Jakarta to Amsterdam, via Singapore. Pollycarpus, detained since last March by police, denies the charges. 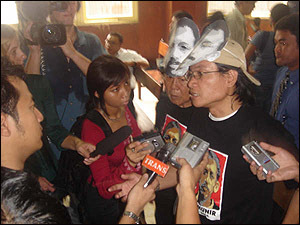 The co-founder and Chairman of Kontras (Commission for Disappearances of Victims of Violence), a group created to investigate alleged human rights' abuses during the Suharto era, Munir was also the founder and Executive Director of Imparsial, a tough human rights watchdog. Munir was awarded a yearlong scholarship to study for a Masters' degree in international law from a Dutch university. On the evening of Sept. 6, 2004, Munir's friends and family gathered at Jakarta's Soekarno-Hatta International Airport to say their farewells. He was tearful as he said goodbye to his wife, Suciwati, she recalled. "It is the only time I ever saw him cry," she said. While boarding Garuda Flight 974, Munir encountered Pollycarpus, who was off-duty at the time, and offered him an upgrade from economy to business class. "Out of service and politeness, I offered a seat in business class to Munir," Pollycarpus told the investigation team. Pollycarpus then moved to first class. During the flight to Singapore, the prosecution alleges that Pollycarpus enlisted the help of two flight attendants to place up to 465 milligrams of arsenic, more than triple a lethal dose, into a glass of orange juice. Munir was then offered a choice of wine or orange juice. The prosecution alleges that Pollycarpus believed Munir, a Muslim, would not drink the wine and would choose the orange juice. Pollycarpus and Munir parted company while the plane was transiting at Changi Airport in Singapore. Pollycarpus maintains he went to Singapore on business for Garuda. The company backs this up, but claims not to know who or if Pollycarpus met anyone during his overnight stay in the Lion City. While waiting at the airport for his flight to Amsterdam, Munir sent an SMS text message to his wife complaining of stomach pains. After boarding the flight, he informed a flight attendant of severe cramps, rushing to the toilet several times to vomit. Flight attendants contacted a doctor on board who administered a tranquilizer. Munir eventually fell asleep. When the doctor returned to check on him a few hours later, he found him stiff and cold. Munir had died somewhere over the night skies of Eastern Europe. Mohammad Assegaf, Pollycarpus' lawyer, accused the prosecution of speculation. "How could he know that the drink would be served to Munir? The prosecution's indictment has many flaws," he told Tempo magazine this week. He is not the only one critical of the way in which the prosecution is handling the case. Asmara Nababan, former vice chairman of the Special Fact Finding Commission (TPF) appointed by President Susilo Bambang Yudhoyono (SBY) to investigate Munir's death, believes Pollycarpus is merely a puppet in a much larger case involving BIN, the country's State Intelligence Agency. Munir's supporters outside the courtroom. Nababan told OhmyNews, "BIN should be investigated." He criticized the trial as being "totally different from the fact finding commission" and called on the President to "release the report immediately" to the public. 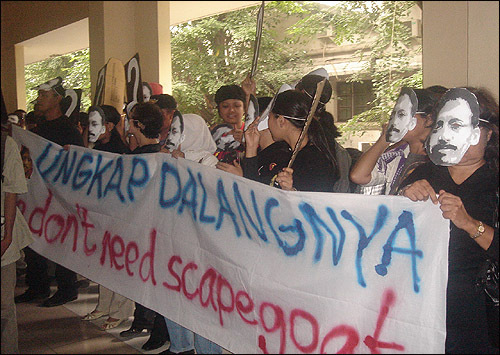 Muir's supporters, wearing paper masks and black T-shirts bearing his image, held a banner reading, "We don't need scapegoats," a reference to Pollycarpus. As Pollycarpus rose to leave the court, shouts of "Murderer!" filled the air. Formed on Dec. 23, 2004, the TPF officially disbanded in June, its work taken over by police investigators. This week Tempo magazine reported to have received preliminary evidence involving mobile phone numbers belonging to important BIN officials. Evidently, two officials contacted Pollycarpus seven times between August 25 and Sept. 7, 2004, the day Munir was declared dead in Amsterdam. Usman Hamid speaks with reporters outside the courtroom, earlier this week. Usman Hamid, a coordinator with Kontras and a secretary with the Special Commission told this reporter, "the prosecutor's don't have a strong indictment because of limited evidence provided by the police," suggesting a possible cover-up. "The motive behind the killing is too general," he said. "The President should take a significant step to find the mastermind." 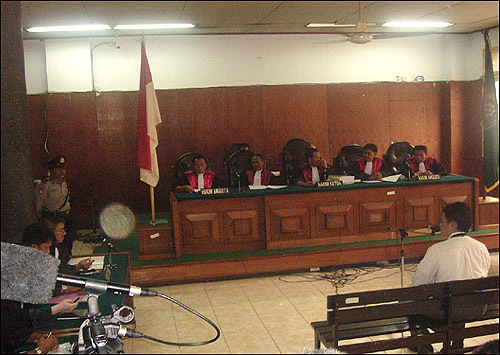 According to the prosecution, Pollycarpus' motive was his belief that Munir's human right's work was harmful to the advancement of Indonesia, a claim that could be very difficult to prove in court. When the special commission finished its investigation, it concluded that the murder of Munir was a conspiracy involving BIN officials with Pollycarpus believed to be an intelligence agent. Many expected BIN to be included in Tuesday's indictment. However, prosecutors appear not to have enough evidence from the police to link the intelligence forces. Speculation has centered on the possibility that the trial is being rigged to fail and that Munir's death may remain unsolved. "Pollycarpus is only a small part of the Munir murder case," said Nababan.